Graphic Designer, Marketer, Educator and Entrepreneur. Roberto Blake helps Creatives and Brands by creating amazing visual branding and content, as well as providing education and resources. Roberto is very active in social media, and is currently writing the "Just Create Awesome Book", planned for a late 2016 release. Making a real investment in their creativity is something that people don’t take seriously enough. I think it has to do with the fact that our society treats creativity as something frivolous or impractical. People may praise it publicly and demand originality or innovation, but they usually don’t put their money where their mouth is. This tends to trickle down into the way creatives think of their craft too, unfortunately. When it comes time to invest in new equipment or polishing their skills, people will find an excuse not to give their creativity the priority of their time or money in favor of more practical things or entertainment. This often is one of the big barriers to success for creative professionals and creative entrepreneurs. My own personal experience has shown me the difference investing in yourself can make, but I’ve seen this is some of the creative entrepreneurs that have influenced and inspired me over the years. From podcasters who made sure that as the grew they invested in better microphones to improve the quality of their sound. To actors who take voice coaching lessons, paid for out of their earnings. I’ve seen countless photographers scrimp and save to get a better lens that would let them take the shots they knew would help them sell the quality of their work to paying clients. Any success I’ve seen in people, even if they were lacking the highest amount of talent, can be traced back to this concept of self-investment. This doesn’t always mean you have to go off and spend a mortgage on an education, or the equivalent of a car on the latest equipment or Macbook Pro. It means identifying your strengths and weaknesses and giving yourself a shot at real growth. One of the things that many creatives who fly solo struggle with is meeting deadlines, even if this comes to their personal goals. Execution is important, but being timely is a real concern. 80% on time will always be better than 100% late. When you are freelancing, one of the pitfalls is a lack of accountability. You don’t have someone you are directly answerable to. 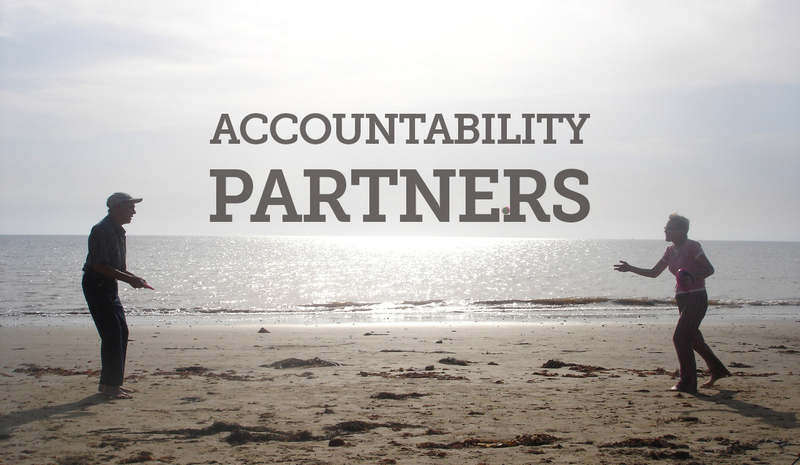 A way around this is to find Accountability Partners. These are others you can share your goals with, while not worrying about jeopardizing your business. Typically these will be close friends, family or colleagues. Find your Accountability Partners. Find people who you can trust and who will help you stay on task. They are not just supposed to give you reminders about your deadlines, but genuinely inquire as to the progress and help you move forward if you’re stuck. You also have to be willing and able to do the same for them in return. Ideally you will want to have 3-4 Accountability partners, so that you can always be sure there will be someone to rake you over the coals if you drop the ball. This will help you stay focused and build more discipline if that is something you struggle with. If there is something else you are struggling with, let me know in the comments section or feel free to twee at me @robertoblake. Personal Branding is more important than it has ever been for your career, freelance business and your life. I don’t care if you want work for someone for the rest of eternity… you need a personal brand. The job market is isn’t exactly stable or reliable. A Personal Brand positions you for the next job, and can give you an income in between jobs, or let you quit a job you hate and do something you love. You Think Personal Branding Won’t Help You? How about 10 or 20? I don’t say this to brag or toot my own horn. I say this to overcome your resistance to the idea that this is too good to be true. I’m not the most creative or talented person in my industry or in anything that I do. I’m not even a professional writer, nor do I have a degree in it. This year I will have made over $10K just from writing. With no degree in film or video production, I built a YouTube channel back in summer of 2013 that now has over 45,000 subscribers and has help established me as an authority and industry expert across multiple creative disciplines. It also has produced a substantial amount of revenue, between advertising, brand deals, merchandise and referral business for consulting and design clients. My personal brand has brought me everything from paid sponsorships, to new clients, to speaking opportunities. It has also brought me some tremendous relationships and helped me build a community and make a difference in the lives of others. I’m not holding back any secrets to success here. What may be natural to me, may be an intensive process or new information to you, and that is perfectly fine. We’re all here to learn together. If you feel that there is something that you need information on I encourage you to ask me about it. If you want to know what tools or resources I’m using to produce my results, I’m not keeping that a secret either, I spell it out in the resources section of this website, and I constantly advocate for those products and brands in social media since they helped me become successful. I’ve gone so far as to give a Free 1 Hour Webinar with a 30 minute Q&A that covers point by point the importance of a Personal Brands as well actionable advice for how you can begin to develop yours and what resources you need. CSAT Podcast- 009 Why You Need a Personal Brand. Personal Branding is more important than it has ever been for your career, freelance business and your life. I don’t care if you want work for someone for the rest of eternity… you need a personal brand. The job market is isn’t exactly stable or reliable. A Personal Brand positions you for the next job, and can give you an income in between jobs, or let you quit a job you hate and do something you love. Creativity is a lifestyle rather than just a matter of talent or skill. This is why no matter how talented or experienced you are you can experience burnout or creative blocks from time to time. Maintaining your Creative Lifestyle properly is important to take into consideration and make a priority. This is something even I struggle with from time to time. Staying in a place where you can feel inspired and motivated to create is something that can be difficult if you’re not balancing your Creative Lifestyle properly. You have to consume creative content, whether this is books, music, movies or actual experiences and adventures. You should also try to surround yourself with other creative people who you can collaborate with or use as a sounding board for your ideas. You have to take care of yourself if you want to do your best work and not burn out. Stamina is important in the long run and you’ll need to keep your energy up, particularly if you’re going to work long hours. Stress can have a negative impact on your work and even make you feel like quitting all together. Try to keep unhealthy stress to a minimum and identify people and situations that cause you unnecessary stress and anxiety. Adopt positive habits that allow you to maintain a happy state of mind. This can be upbeat and positive music, having interactions with positive people and doing things that you enjoy on a regular basis. CSAT Podcast: 007- Should You Ever Work For Free? CSAT Podcast 007: Should You Ever Work For Free? Creatives like photographers, designers, writer and artists are approached sometimes to do free work or work in exchange for exposure. This is a very important and controversial topic in the Creative Community. I feel that there are situations where it is appropriate, but I think that in most situations it should be the Creator who initiates it. I think that when companies ask for free work they are not valuing Creatives appropriately if they don’t find a meaningful way to compensate them. When Is It Okay To Do Free Work? If you are going to work for free, the first people you should offer this to are friends, family and people who have already invested in you and supported you. It is a great way to say thank you, know that they will appreciate what you’re doing and it is a good way to have a positive client experience and develop good/positive relationship habits. When Is It Not Okay To Do Free Work? Many people have made the argument that if they want to do work for free and not charge people that is their right and their business. While on some level I can appreciate their argument… it’s a selfish argument. When people do that the are taking money and business away from people that actually need it. If you love doing something as a hobby, don’t do give it to “clients” that someone else could be charging and appropriate fee to. Give it to a friend or family member or keep it to yourself if you don’t want to charge. You are literally hurting other people by giving it away. This applies to active services and things that have a cost associated with them. I give away free content and resources to create value for other people and from a marketing standpoint you could also do this to create interest in your paid offerings. There is nothing wrong with a “Free Sample”. You also shouldn’t let a client pressure you into doing work for free, or an employer if it is outside of the scope of your job duties or after hours. Many creatives make the mistake of doing side projects or extra work for free, giving up their own time or resources on the behalf of people who are not going to compensate them or appreciate them. Never allow yourself to be bullied in this way or taken advantage of. Value yourself and respect your work enough to walk away from the situations. If you don’t feel you are in a position to do so, create a scenario where you are next time. Create Value for Someone Without Them Asking You To! Find someone who you genuinely care about and want to invest in, someone who is doing something worthwhile that you think is Awesome! Offer them your time your talent and you sense of care and consideration. Take a look at the difference it makes in their life and the impact you had. See if you don’t feel more empowered and really think about how being able to have the luxury of making a difference for some made you feel. I honestly have had the experience of it making me appreciate the value of my abilities even more, and helped me be comfortable asking for what I truly believe I’m worth. CSAT Podcast 007 Should You Ever Work For Free? CSAT Podcast 007: Should You Ever Work For Free? Creatives like photographers, designers, writer and artists are approached sometimes to do free work or work in exchange for exposure. This is a very important and controversial topic in the Creative Community. I feel that there are situations where it is appropriate, but I think that in most situations it should be the Creator who initiates it. I think that when companies ask for free work they are not valuing Creatives appropriately if they don’t find a meaningful way to compensate them. 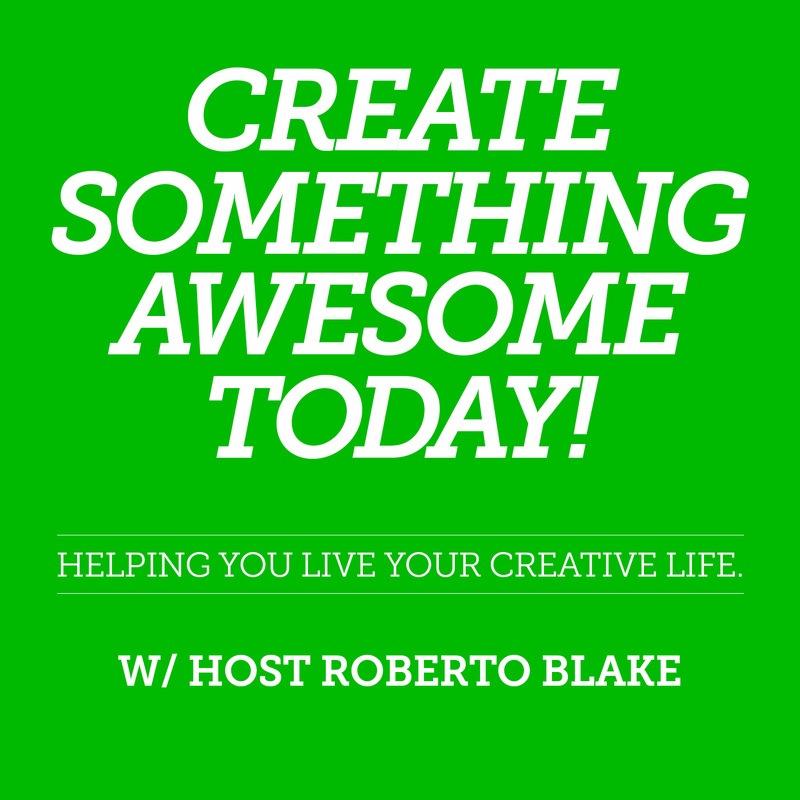 Create Something Awesome Today Podcast: 006 Breaking Through Creative Blocks. Creative blocks can challenge all of us whether we are writing, doing photography, art or design. It’s important to feed your creativity and break out of habits that might end up holding you back. Stretch your creative muscles and feed your creativity by trying new things and having new experiences. CSAT Podcast: 005- Is Creativity Undervalued? Is Creativity Undervalued? In many cases it is by the general public as well as clients/employers. Most of this has to do with not being educated about what Creative professionals do. Its very hard to value something you don’t understand. And in an age where people feel that tools and technology are more responsible for the results than the human beings behind the gadget, it is an uphill battle. But Creatives also have a responsibility to educated people appropriately. On the other side of this, sometimes as creators we prioritize creativity and the expense of consistency or context. Sometimes a designer or photographer will worry more about getting something cool for the book, than what the client actually really needs from them. This can be a problem. I feel there is a way to balance your needs as a Creative, with doing what is best for the relationship and the project. I explore these ideas in today’s episode of the Create Something Awesome Today Podcast! CSAT – 005 Is Creativity Undervalued Create Something Awesome Today Podcast. If you are looking to get new clients, then you need to really think about your search and discovery strategy. While a lot of this comes down to having a Website there are some other options available to you as well. How many of you have portfolio on Behance? Does anyone have a blog? You really should be using these things to your advantage. Every platform is an opportunity to network with potential clients. Also don’t underestimate getting out from behind the computer and putting yourself out there. Something that has helped me personally as been my blog, and my YouTube channel and now the new Podcast. But I also go to events and network with people on a regular basis. I turn every interaction into an opportunity. This doesn’t mean always pitching people, it means being interesting, not being afraid to generate a relationship out of thin air, and then giving them my business card. When they can’t give me one back, have a micro conversation on how important they are and the fact they should really get one and use it to get people to their website after they meet them…. “But I don’t have a website…” You absolutely need one. Let’s meet up for coffee in a week, but give me a call tomorrow they are so much more affordable than people imagine and I’ll help you figure it out..
Do you see what happened there? Potential print work, possible logo design on the table and branding…. website pitch… all by being able to talk to a stranger. Over the course of the year, helping someone build a visual brand from scratch can be a $2000-$5000 relationship. That means generating 20-50 strong relationships a year puts you at being a 6 Figure designer…. something most people can’t imagine. It boils down to empathy, hustle, guts and MATH. You can’t always find those 20-50 relationships locally. That is why networking well online, traveling a bit, setting up not only on online presence but an infrastructure and strategy are so important. I get 10+ projects a month. I don’t think I’m supremely talented as a designer, so that is not the reason. It’s that I’m very visible, and the funny thing about it is that is cost me next to $0. I want everyone who reads this to comment below and tell me and the group how you plan to execute on this information over the next 30-90 days. If you’re struggling with clients and you actually do execute on this within that time frame, the struggle shouldn’t be as real anymore. Finding and maintaining your motivation as a creative person can be challenging. It’s one of the more difficult things that designers, and other creatives had to deal with in their life and work. It’s important to take responsibility for this and position yourself to have the outcomes that you want. Start your day with things that will inspire and motivate you. Set goals that will allow you to create the great experiences you want to have that day. Intentions do matter. You have to set your intentions towards having an awesome day, and this could mean any number of things: It could be that you will consider the day a good day if you accomplish a specific thing, or you could promise yourself a rewarding experience later in the day if you meet certain conditions. You have give yourself an incentive for being positive. It doesn’t matter whether you are the type of person that sees the glass half full or half empty, take the opportunity think of how you can fill up the glass. Fill that void, create that value for yourself and other people. While it is great if you have people that motivate and inspire you, it is not their responsibility to do so, it’s yours. Granted they should want to do that, since it would be a way they could “Create Awesome” and there is the obvious upside of them getting more value from you as a result, but you can’t rely on or expect this to be the norm. You have to schedule time to consume inspiration and motivation for yourself and make it a priority and part of your process and habits. CSAT – 004 How Creatives Can Find Clients Create Something Awesome Today Podcast. Episode 001: Create Something Awesome Today! Welcome the first every episode of the Create Something Awesome Today Podcast! Yes I know that title is a mouthful! You can easily measure the value of your time via a meaningful result each day. It makes breaking down large goals easier and can even help you achieve them more quickly. If you are creating products this could mean that you are building up your inventory and revenue. If you are creating content this can dramatically help you grow and audience or build a reputation. When taking on large scale creative projects they can become less daunting. It can encourage you in terms of feeling like the day wasn’t a total waste if you created something you care about. When creating awesome experiences and relationships, this can have a deep and lasting impact on your life. In terms of your skills, creating something each day could help you get faster at producing meaningful results. Part of how I Create Awesome each and every day currently is through the content I put out on YouTube and also via social media platforms. This allows me to Create Value for other people but also a meaningful result I care about, builds my reputation and body of work and allows me to become faster and more savvy across multiple skills such as SEO, Video Editing, Social Media and Content Marketing. Obviously there is also the benefit of passive income from the advertising associated with the content. Creating Something Awesome can ultimately mean what you want it to mean. It could be creating great content, it could be creating great experiences for everyone you encounter or it could even be creating new relationships. The important thing here is to spend every day creating the value that you want to bring to the world and being satisfied with something you’ve done at the end of each day. This will help you stay encouraged and also allow you to quantify your progress, something that can really help your self esteem and sense of worth. It also will potentially build positive habits that will make you more productive and accountable. 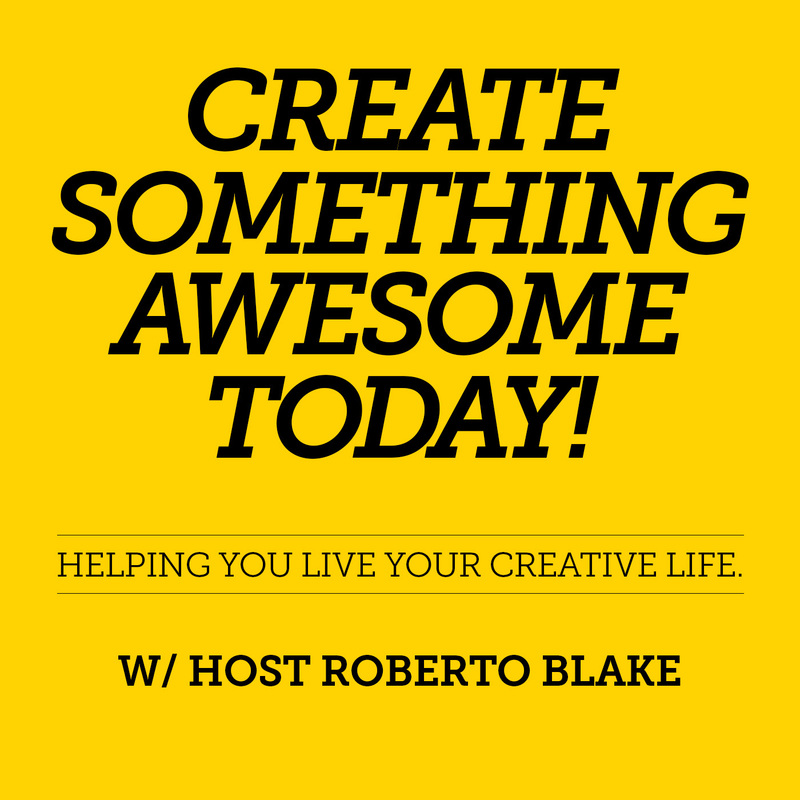 The Create Something Awesome Today Podcast is hosted by Graphic Designer, Author and Marketer Roberto Blake. This podcast features motivation, education and guidance for any creative individual looking to learn, grow and live the creative life they’ve always dreamed of.